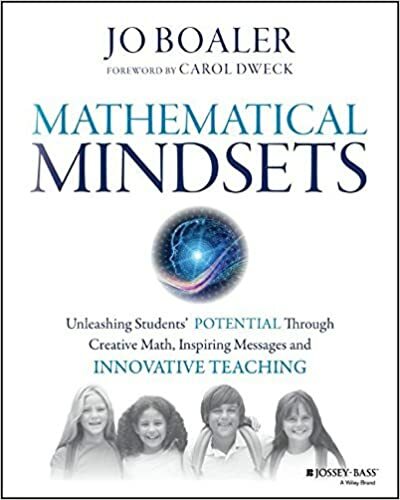 I'm really sad that I came across this book, Mathematical Mindsets by Jo Boaler, after 8 years of teaching because I think of the past 8 years and how differently I could have been teaching math. However, the past is in the past and while I may not have been teaching math the best way, I did make sure my students enjoyed math even if they felt they "weren't good at math". I will tell my students on the very first day of school that they are all mathematicians and everyone of them will enjoy math at some point this school year. I will no longer allow them to say "I'm not good at math" or "I'm not a math person". I will no longer use programs that encourage fast recall of math facts. I will use low floor, high ceiling tasks that will push all students to work at the highest level. I will no longer assign meaningless homework, but rather have students reflect on what they learned that day. I will push my students to create a visual representation of problems. I will allow my students to explore first rather than teach methods/procedures. I will ask my students to reason and critique others by convincing themselves, convincing a friend, and convincing a skeptic. I will teach students to work together by establishing group norms and roles. I will make sure my students know I am not necessarily looking for an answer, but rather how they get there (and that there are often multiple ways to get there). I will provide constructive feedback and take the focus off of the grade. I will give assessments for learning that will allow my students to see where they are now, where they need to be, and provide feedback for ways to close the gap. I will slow down and go deep into math topics rather than rush through them to keep on pace with the curriculum guide. I will provide real-world context for math problems when appropriate. While this list seems long, many of the things I am already doing some form of it in my classroom, this list is more to hold me accountable as I begin looking at my lessons in the beginning of the year. Next up on my reading list is the Mindset Mathematics, Grade 5 by Jo Boaler, Jen Munson, and Cathy Williams! 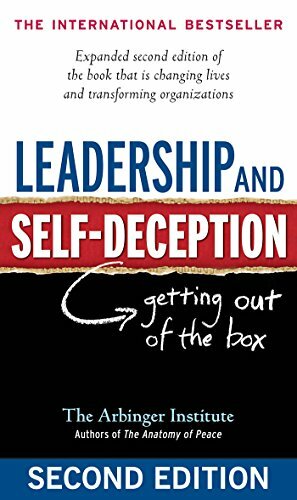 I was given the book, Leadership and Self-Deception, by the Arbinger Institute last summer. However, having just come back from maternity leave, I set it on my shelf and left it. While cleaning up my room at the end of the school year I decided to bring it home and it happened to be the first book I picked up this summer. It was a surprisingly easy book to get through (done in 2 days), but it definitely opened my eyes to the types of people that I will encounter as a teacher leader and hopefully as an assistant principal one day. I should hopefully be completing my administration internship this year and am beginning to open my eyes to look at things from not only a teacher perspective, but also an administration perspective. My biggest ah-ha moment came at the end of the book, where there was a list of things that you should and should not do in order to stay out of the box. 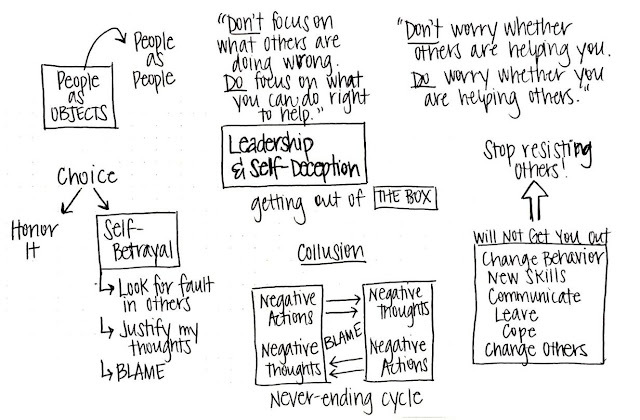 On my sketchnote are the two quotes that resonated with me the most as a leader. "Don't focus on what others are doing wrong. Do focus on what you can do right to help." As a leader, it is easy to want to focus on what teachers are doing wrong, however, in order to stay out of the box (and keep that teacher out of the box) we need to focus on what can I do as a leader in order to help that teacher. "Don't worry whether others are helping you. Do worry whether you are helping others." I often hear this type of situation at the teacher level. There are teachers who enjoy sharing their lessons, activities, ideas, etc. and there are teachers who don't. We have to stop worrying about whether everyone is sharing or helping us and instead focus on am I helping others. I would like to say that I am "out of the box" most of the time in my life and career, but as I was reading it definitely made me think of times that I was "in the box" and made me think about why I may have felt that way. This is a great book, not just for the education world, but for any business/company. While attending the EdTechTeam Maryland Summit I was able to attend a session by Abbey Futrell (www.abbeyfutrell.com, she's hilarious and if you ever get the chance to see her speak I would highly recommend it!). In her session I was introduce to the tool called Flippity. You can access this tool two different ways. You can use it as an Add-on through Google Sheets, or you can go to www.flippity.net and make a copy of the templates that can be used with Google Sheets. (I recommend just getting the add-on since you only have to do this once, then all of the templates are easy to access anytime you open Sheets) The website is awesome though because it gives you a demo of each template, instructions for how to use the template, and a link to make a copy of the template. While I don't know that I would use all of these templates in my classroom, there are a few that I think would be beneficial for my students this upcoming year. I really like that for many of the templates you can add images, which would greatly benefit ELL students who need help with content-specific vocabulary. I also think many of these templates would benefit the primary grades where you have students working on sight words (ie. matching, bingo, flashcards). Lastly, my focus for this upcoming year is to incorporate more creative writing with my students and I feel that the MadLibs and Mix & Match templates would lead to some fun creative writing. Check out my presentation here for how to get Flippity as an add-on and a preview of the different template types that can be found on their website or under the add-ons menu for Google Sheets. Technology Should Never Come First! When the educational technology phase first began it was exciting. Look at all of the cool things that we can do by using a chromebook or an app or a website! I was in a 1:1 classroom with chromebooks and thought wow, everything can be digital it will be so much easier! Flash forward 5 years later and I have realized that there were times I was doing a disservice to my students because I was making something "digital" that had no reason to be digital other than it was completed by typing on a chromebook. And guess what, after having the students complete some of the things electronically, I was still having to go and grade every single Google Doc. So what was the purpose? I realized that I needed to do some research. What was the true purpose of integrating technology into a lesson? I was putting the technology first and then figuring out what I wanted to teach. What I found was that it needs to be the other way around. As teachers, we must first determine what it is that we want students to learn, THEN decide what technology we should use. And guess what... there are going to be times that technology just won't fit into a lesson and that's okay. When thinking about technology last, it allows us to use it as a resource. We should be thinking about how technology can ENHANCE our lesson. Do we want students to collaborate on a project? Do we want students to have choice about how they will learn? When asking these questions after determining what the students will learn will allow us to then think about what technology can be used or better yet, will allow the STUDENTS to determine which technology they want to use. I used to think I had to have some form of technology in every lesson. Yes, using Google Forms for an exit ticket is great because it can grade it for me, but is it worth it? By the time it takes the students to log onto the chromebooks (this is assuming they weren't already using them for something else during the lesson), sign into Google Classroom, click on the Form, and answer the questions/submit it, I could have just given them a piece of paper with the same exact problem(s), had them answer, then quickly glance through the papers to see who got it and who didn't and move on with my lesson. While it is tempting to want to try out the latest and greatest application or tech tool, remember... first decide what it is you want your students to learn, then worry about integrating technology. We must always remember that the students come first. How is it that this tech tool is going to HELP my students? I have A LOT of books in my classroom library and have them organized by category, author, series, etc., but there are times that I would love to make suggestions to my students based on their interests, but I have NO idea what is even in my library anymore. Between buying new books each year to those books that like to grow legs and leave my classroom (to be quite honest, if a student borrows a book or even takes it on purpose, I'm okay with it because my hope is that they are actually reading it! ), I have lost track of which books I actually own. I have been searching around for a good database or app that would organize all of my books and just didn't seem to find one, so now enters the good ole trusted Google Sheets. Once the books are in Sheets that I can easily sort them or filter them to help find books on a certain topic or interest (and level although I never tell my students that). Now the question is getting them into Sheets. Before packing up my classroom at the end of the summer, I downloaded the Scholastic Book Wizard and had a couple of students organize my books and scan all of them into this app. (One perk to teaching 5th grade) However, once they are in the app there isn't much to do with it, other than keep track of which students borrow each book. It allows you to email the list of books, but it is literally an e-mail with the books in a LONG list with no other data. I created a form with the categories that I felt were important to me as a teacher. These included Title, Author, Series, Topic, Location in Class Library, and Level (we use Lexile at my school, but you can use whatever leveling system works for you). Typing all of the books into forms can be time consuming, but once it is done the list that you will have will be worth it! You could always get an older student to type in the book information for you. See my Google Form here! Once the list is compiled in Google Sheets, you can sort or filter the results quite easily. First, I will hide the Timestamp column because that has no importance to me. To do this Right Click on the grey area near the A or click on the little drop-down arrow next to the A and click Hide Column. Next, I do a little clean-up, but adjusting the column widths (click on the line between the two columns and drag to desired width), made the headings in the first row centered (click on the grey area with the 1 to highlight the entire row then click on Center Align on the toolbar), and made the Lexile levels centered (click on grey area with the F to highlight the column then click on Center Align on the toolbar). To be able to Filter the results, click on the grey area above the 1 (to the left of the B column). This allows you to highlight the entire sheet. Then click on Data in the menu bar, then Turn On Filter. You should now see a little grey triangle shape next to the headings in each column. By clicking on the triangle you can sort A-Z, Z-A, or type in the search bar to find something specific. This database is not only great for the teacher to keep track or suggest books in the classroom, but if you teach older students, they can use the database to search for books as well. You could even add an additional column with a checkbox to keep track if a student checks out a book from the library. Hi! My name is Amber Potter. I am a 5th grade teacher in Prince George's County Public Schools in Maryland. I am married to a wonderful husband and mother to two little humans. When I am not at school (or doing work for school at home), you can find me cooking, traveling, and spending time with family. I am a huge fan of educational technology and can't wait to share my classroom journeys with you!